Michael Kwok Buy PCCS near 40 cent.Will see from there.Or buy AT(0072) because monthly chart oversold for almost 1 year or more.The new beginning from AT this year 2019 after new factories alreAdy begin production at a rate of 20 over percent.Contract of 10 year already on 2-3 year.As time go on the production and contract will increase. legend Banyak sudah jatuh lobang…! stevefei Can collect now. well drop. Santaitrader Good bye pccs. Thanks a lot. Ziko Ro Tsunami coming !! unice Already drop 20% from 55sen, 45 Sen should be good bet. Michael Kwok Please near 40 cent buy.38 cent strong support.If violates in high volume sell back to cut loss. latuk there i am right. someone out to talk down the stock already. these are the same ppl who talked about TP 0.60 few weeks ago. 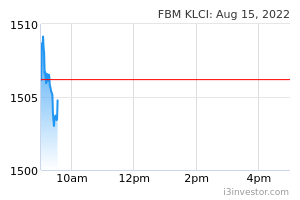 nckcm First day of drop then can confirm will rebound...? Hello how high pccs has gone..
nckcm Up for so many days drop 2 days only then go buy... smart..
AmateurApprentice can share KYY's comment ? I cant find it anywhere. The blog with KYY's name is authored by Captain Marvel. latuk see. different comments now. megacity no detail show kyy buy, don't spread the rumor. this counter no need kyy to buy. megacity crazy wa, up more than mother, down slower than mother. Michael Kwok u see I say buy near 40 cent.Low was 43.5 cent.Now the engine will start to be above 60 over cent.Put its as another round of upward of 45-55 percent starting from 50 cent. latuk see. now ppl talking about new upward momentum. VincentTang OTB just sell call PCCS due to earning from Q1 and Q2 2019 were from one off disposal gain and not from operational gain. Be careful. megacity Don't talk too much, want sale go sale want buy go buy. Rumor can't make this counter up or down because no announcement of company at all and the rumor discuss only at this forum. megacity go ahead buy you own counter and earn more no need to introduce here, why so many people like to push their stock at here, this side is advertisement area? Ziko Ro Full of gaming.!! ltg100y @VincentTang, why OTB not mention about Q3? Base on quarterly report, Q3 gain of disposal PPE only 242k, Forex gain is 148k but net profit is 4.55 million. Let's see Q4 result in May. Michael Kwok Probably will reach the lower end 40 cent again.Dear market is funny. 0.40. are you talking about pccs wa? Michael Kwok please lower end 40 cent means 40-43 cents.Can take stock one level at a time.Let fate determine how much shares a Person can get. Ziko Ro Now bulding a strong base and momentum on small volume. Good sign to go up. latuk buy low and sell high. keep to this principle.